A 53 year old patient presented with backache. A skeletal survey was performed that showed punched out lesions in the skull. The bone marrow aspiration showed 21% plasma cells. The haemoglobin was 10.1g/dL, serum calcium and creatinine were normal. 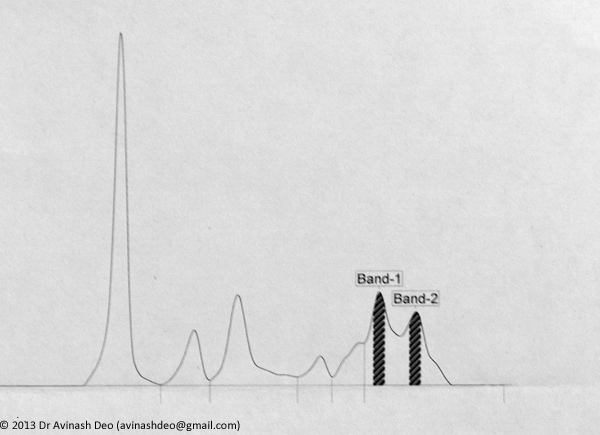 Immunofixation electrophoresis showed a biclonal gammopathy both bands were IgA and λ. The free λ chain level was 179mg/L and the free κ chains level was 27.4 mg/mL with a free light chain ratio of 0.15. The albumin was 2.5g/dL and the β-2 microglobulin 4.9mg/ml. The patients was diagnosed as multiple myeloma stage II by ISS and treated with bortezomib and dexamethasone followed by an autologous stem cell transplant. Clonal gammopathies are monoclonal in 95% of the patients, biclonal in 5% of the patients and triclonal in an occasional patient. Biclonal gammopathies are more commonly associated with symptomatic disease than monoclonal gammopathies. About 40% of the patients with biclonal gammopathic have been found to be symptomatic in a large series (Blood 2008;112; Abstract 5151). About 60% of the symptomatic patients have a lymphoproliferative disease most commonly Waldenström’s macroglobulinaemia. About 20% of the symtomatic patients have multiple myeloma and another 20% have a non-haematolgical cause. Patients with a monoclobal gammopathy of uncertain significance who develop a second clonal gammopahy should be evaluated afresh a malignancy.